With its reverse design the Forest Economy 6 x 4 Overlap Reverse Apex Shed is a shed that is certainly a little different looking from some of the other discount sheds. 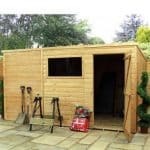 For those who are on a budget or who have a garden that does not have room for a large shed, this shed would be ideal. It is low in price, but it does offering you a fair amount of storage space without taking up all the free space your garden has to offer. The reverse nature of the shed puts the door on the side where it sits right night to a good sized styrene window that will let natural light get in the shed. 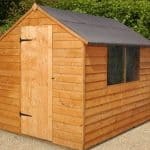 This is a very intelligently designed shed that has been made with good materials, but not at the expense of the price. The walls are made with 8 mm overlap cladding which is actually a bit more robust than you would think. Also this kind of cladding is excellent at keeping the rain at bay. To make sure you get many years of use out of the shed, a good, solid frame has been used. This along with that cladding make a great team which keeps the shed standing strong. 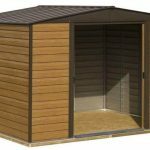 With its reverse design the Forest Economy 6 x 4 Overlap Reverse Apex Shed is certainly one of the more interesting discount sheds we have seen. We are used to seeing an apex shed with the door right at the front, but it being on the side does give it a bit of a different look. 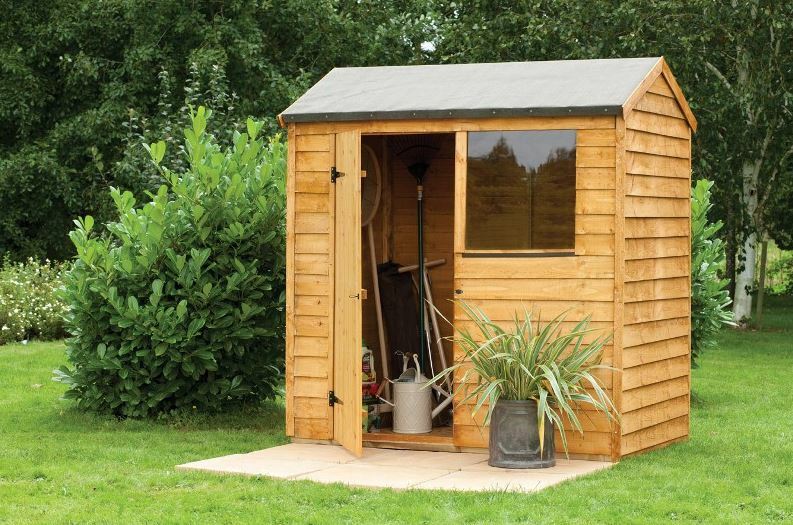 This shed is a great compact sized shed, made for gardens where space is a little tight. The width is just over 6 feet and the depth is 4 feet 3 inches so while at first glance it may seem there is not a lot of storage space on offer, if you are smart with how you organise your belongings or have some epic Tetris skills, you can actually make this space go pretty far. At its peak the shed stands at 6 feet 4 inches so along the ridge you do have a generous amount of headroom. We did mention earlier that this shed has an apex style roof. The reverse nature of it does give this an appealing to the eye design and the slid sheet boarding it is made of is strong enough to handle plenty of snow. On the very top we have some roofing felt that is used to keep the costs down, but to be fair it is the same standard kind of roofing felt we have seen on many, many other sheds. Due to this being in the discount sheds range they did have to make a couple of sacrifices to ensure the Forest Economy 6 x 4 Overlap Reverse Apex Shed was affordable. One of these was using a slightly thinner cladding than we would have liked. 8 mm thick overlap cladding is what they have gone for and we must admit we do like the rustic look it has. While in an ideal world a minimum 12 mm thick would be the standard all sheds have to adhere to, 8 mm thick is more than thick enough for a budget shed like this and the overlap nature of it will keep the rain out very well. They do not give the exact dimensions of the frame that is inside here, but we have seen more than enough sheds to know a 28 mm x 28 mm frame when we see it. We feel the frame they have gone for in this shed is ideal. It will keep it strong for many years, but it also does not mean they have to increase the price at all. Much like the roof, solid sheet boarding has been used for the floor. In all honesty this kind of flooring is perfect for a shed like this. It does not cost a lot and it can take the weight of many, many heavy tools and items. It may not be the best looking floor, but in a general storage shed you really do not need a floor that is easy on the eyes. The Forest Economy 6 x 4 Overlap Reverse Apex Shed will have a general base coat treatment applied to the wood that will look after it during delivery and installation, but for long term protection, you will need to give it a coating of wood treatment shortly after construction. Also once a year a fresh coating should be applied in order to keep the wood free from rot and decay. Like other discount sheds as long as you look after the wood, you do get a generous guarantee. This one comes with a ten year anti rot guarantee which we feels very generous. The reverse nature of this sheds means that the door is located to the left on the front. It is a single sized door that is very smart looking thanks to the vertical cladding used and those black door hinges which will prevent it from sagging as the years go on. We do feel that perhaps a small window or even some kind of decoration would have given the door a little bit more personality. We have seen many discount sheds that do not have a window so it was good to see the Forest Economy 6 x 4 Overlap Reverse Apex Shed does have one fairly large window. The window is made from styrene and it will mean that in the daylight, you will have a good flow of natural light inside. The door comes with a hasp and staple, but no padlock so you will have to purchase one if you want to keep the door locked. But the hasp and staple will keep that door securely closed, even if it is windy. But if you do have an expensive mower or tools in there, you may want to head to your local pound shop and pick up a padlock. There is a window on the front of the shed, but we do not feel that this results in a huge lack of privacy. Even though the window is a good size it is to one side so you do not get to see into the entire shed through it. A curtain or some kind of fabric would be ideal and cheap to cover it if you are worried about people seeing what you have inside. You need to treat the wood in order for the Forest Economy 6 x 4 Overlap Reverse Apex Shed to stay free from rot. Well they do offer some different coloured wood treatment options. A 5L tub will cost you £24.99 and is available in the following colours: Red Cedar, Dark Brown, Golden Brown, Light Brown, Clear, Rich Mahogany, Holly Green and Summer Tan. Apart from the different colour wood treatments, the only other extra that is on offer is an installation service. 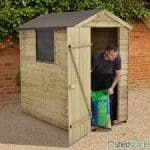 This costs an extra £116 and to be honest while an installation service may sound appealing, it can make discount sheds turn into more expensive ones so we suggest you install it yourself and keep that £116 for something more fun. For the price we are actually very happy with the overall quality of the shed. Of course a few corners had to be cut to keep the price down, but in general we are pleased with how this turned out. You are going to have to look after that wood with regular coats of wood treatment, but the cladding and frame are strong enough that you are going to get 10, 20 or even more years out of this shed. This is a little on the small side, but that is by design. This shed is made for people with smaller gardens and the space can go pretty far if you organise your things just right. As long as you have a friend to help, we do not see there being any issues with installation. It maybe a little tricky here and there, but for the most part you will have no trouble at all. The asking price is very fair. 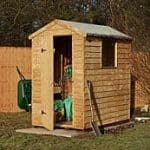 This is a budget priced shed so you have to keep that in mind when it comes to the quality, but we do feel that the materials used for the price they are asking is right in line with what we would expect. Final Thoughts: We have looked at many discount sheds and the Forest Economy 6 x 4 Overlap Reverse Apex Shed thanks to its reverse design is one that sticks in our mind. 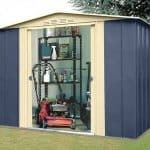 It is a very good and compact budget shed that is not going to break the bank, but it is going to give your garden that space for storage you need. The door and the window that they have used really do give this some personality and we are sure you are going to love the way it stands in your garden. We feel that this is a shed that should make the shortlist of anyone who is looking for a compact shed that is also low on price.